Jamee Jackson walks with a boot on his left foot before Thursday’s game vs. Mount St. Mary’s. 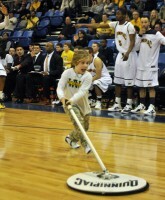 Zaid Hearst gets called for a charge in the first half of Quinnipiac’s game vs. Mount St. Mary’s. 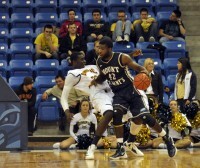 Ike Azotam dribbles the ball near Ja’Colby Wells in the first half of Quinnipiac’s game vs. Mount St. Mary’s. James Johnson goes for a layup in the first half of Thursday night’s game between Quinnipiac and Mount St. Mary’s. 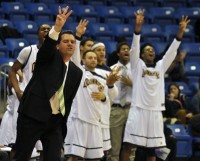 Quinnipiac head coach Tom Moore signals a play in the first half of Thursday night’s game vs. Mount St. Mary’s. Evan Conti attempts a last-second shot over Josh Castellanos in the first half of Quinnipiac’s game vs. Mount St. Mary’s. Forward Marquis Barnett yells as he is knocked to the floor in the second half of Thursday night’s game between Quinnipiac and Mount St. Mary’s. Quinnipiac’s Marquis Barnett walks off the court with a trainer in the second half of Quinnipiac’s game vs. Mount St. Mary’s. Fans react to a foul call in the second half of Thursday night’s game. Garvey Young goes up for a layup in the second half of Thursday night’s game between Quinnipiac and Mount St. Mary’s. James Johnson makes an underhand layup attempt in mid-air after a whistle in the second half of Thursday night’s game. 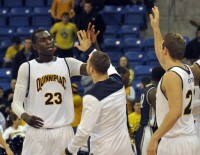 Dave Johnson passes the ball to Ousmane Drame in the second half of Quinnipiac’s game vs. Mount St. Mary’s. Ousmane Drame dunks after receiving a pass from Dave Johnson in the second half of Thursday night’s game between Quinnipiac and Mount St. Mary’s. Ike Azotam dunks the ball in the second half of Thursday night’s game between Quinnipiac and Mount St. Mary’s. Quinnipiac’s Ike Azotam, Zaid Hearst and Dave Johnson react after Mount St. Mary’s calls a timeout in the second half of Thursday night’s game. Quinnipiac’s Garvey Young and Mount St. Mary’s Danny Thompson battle for the ball in the second half of Thursday night’s game. A girl runs on the court in the middle of play in Thursday night’s game. Quinnipiac’s James Johnson puts up a shot against Mount St. Mary’s Danny Thompson in the second half of Thursday night’s game. 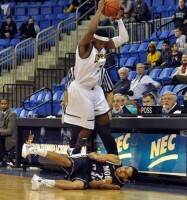 Quinnipiac’s James Johnson gets tripped up in the second half of Thursday night’s game. Quinnipiac’s Ousmane Drame draws a foul against Mount St. Mary’s Danny Thompson in overtime Thursday night. Ousmane Drame puts up an underhand layup in overtime Thursday night. Quinnipiac’s James Johnson goes for the ball near midcourt in overtime Thursday night. Ousmane Drame high-fives teammates after a timeout in overtime in Thursday night’s game. 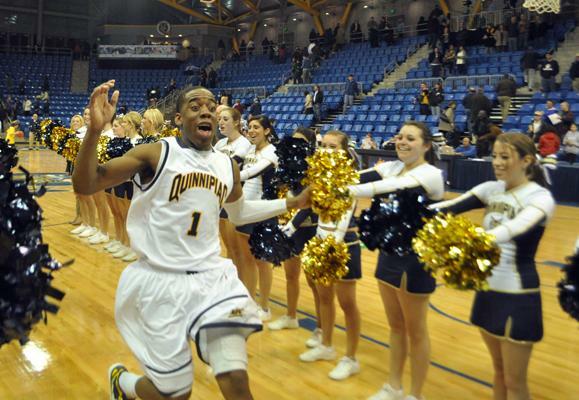 Zaid Hearst celebrates Quinnipiac’s victory after the buzzer in Thursday night’s game vs. Mount St. Mary’s.